Thanks to all for the smart responses to my query yesterday asking why it is that Rick Perry's maladroit debate performances are being judged to be so much more devastating to his prospects than were George W. Bush's back in 1999. My colleague Noam Scheiber, who will be soon be gracing the Stump on a regular basis, offered another theory that elaborates on one of my suggestions, that Perry suffers from a class bias, or as I put it: "Bush and his loyalists shrugged off his shaky debates with the cockiness of the prep-school slacker shrugging off a bad grade. He was the Andover, Yale and Harvard biz school kid who skated by on gentlemen C's with the assurance that he'd do fine in life anyway. Whereas even within Texas, Perry has labored far more against the image of the country bumpkin who is a few posts short of a full fence, the boy from Paint Creek who graduated 10th in a high school class of 13 and had to switch to animal science after failing out of veterinary school." "I think it goes further. 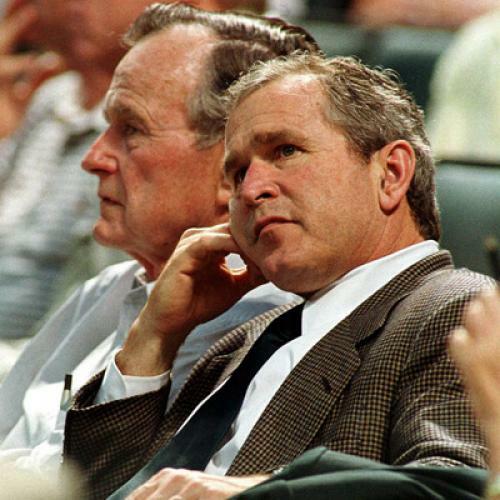 With Bush, people didn't just think they were getting an inarticulate Texas governor who was acceptable because something rubbed off on him while he was stumbling through Andover, Yale, and Harvard. They thought they were getting an inarticulate Texas governor who'd stumbled through Andover, Yale, Harvard and had access to the network of advisers and wise men his family had been collecting for decades, which was reassuring. That is, it's not just class but political pedigree. People were comfortable voting for the venerable firm of Bush Inc. even if they weren't super comfortable with W himself, in the same way that many investors (at least the remaining ones) will hang on to their News Corp stock when Rupert leaves and James succeeds him, even if they regard James as a mediocrity. Perry doesn't benefit from a similar sort of institutional incumbency..."
This fits with something I heard from a veteran Democrat in Texas, a former state official who has known Perry since he was in the state legislature. The difference between Perry and Bush, he said, could not be overstated and it came down to a difference in "exposure." "The difference between Bush and Rick Perry is that Bush went to Andover, Yale and Harvard and Rick Perry went to Paint Creek High and almost flunked out of vet school at A&M. There's a difference in the exposure they had. George Bush's dad was president and vice president, etc., while Rick Perry's dad was on the county commission. It's just a total difference in how they would approach politics...The guy who goes to Andover, Yale and Harvard is going to have a little different perspective than a guy who ends up with an ag degree after almost flunking out of vet school." That is, even if Bush had trouble getting the words out, you knew he'd hung around with people who could. Though even that, of course, ended up proving to be little comfort.